I would like to buy a vintage sewing machine but what I want it for is free motion quilting. What type of machine would be a good one for this or are they best for piecing? Please help!!! I'm not an expert, but I'm thinking they would not be the best choice for free motion quilting because of the distance between the needle and sewing machine. You'd probably want that area to be larger than the vintage one seems to be (but I'm not sure). Unless you plan on free motion quilting little things (placemats, wallhangings, etc. )....I'd say it probably wouldn't work for you. You will also want the feed dogs to be able to be lowered....not sure if the vintage ones can do that. I'm sure some of the vintage machine enthusiasts would be able to better answer your questions. Good luck! Many vintage machines have feed dog drops, or some you can easily take them off entirely. I've never tried FMQ so I can't answer beyond that. Howdy from KS. I use my vintage Singer 15-91 for FMQ. The feed dogs can drop easily and it makes a lovely stitch. The throat space is 7 inches. Once I started using it for FMQing, I will never go back to using a cheap plastic machine again! I feel like I have a lot more control. This quilt pictured here is a Full size quilt. It wasn't hard at all. Thanks for your help. 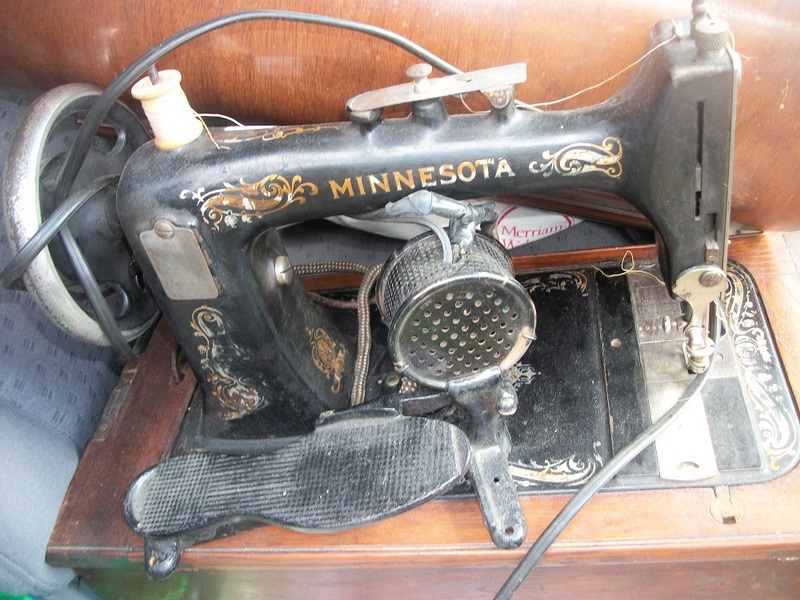 I think I will get a vintage sewing machine. 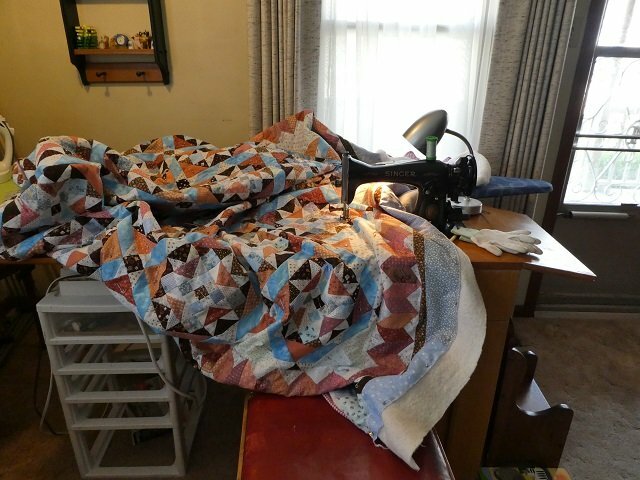 Singer 15 is a favorite for quilting and free motion. The later one with the stitch length lever can drop the feed dogs. The earlier ones require a feed dog cover, they have a sort of screw and nut stitch length adjustment. I have seen people set up model 66 to use on a frame, I guess they remove the feed dogs. Some have set up 201 exclusively for free motion quilting and even embroidery. They do full size bed covers with the thicker type cotton wadding (batting?). I am on the look for an early cast iron zigzagger, and I have read good revies on Necchi BU. You can't really go wrong with the old straight stitchers, it probably have some advantages to a lot of new machines. My favorite machine to use is a 201. The advantage with a 15 is mostly for quilting, it has the CB bobbin case many like, though it doesn't entirely exclude models with drop in bobbin case. The Singer 15 was also my fav for FMQ Though I bought a LA pretty early on so only did specialty stuff on the 15. I agree with those who prefer the vintage straight stitchers. They usually have a narrower body above the needle area which gives a better of sewing area than the more boxy new machines. I tried free motion on my Singer 9960 and oof...it was a struggle. Then I tried a vintage straight stitch Monarch (classic black Singer 15 clone) with feed dog drop and it was a lot easier. I finally understood why people actually enjoyed free motion quilting! One note, some of the foot controllers on the vintage machines are kind of zero to sixty in speed. If this is the case on the machine you get, it's pretty easy to change it to a new electronic foot controller. That really helped me with variable speed control and my stitching improved. There are videos and tutorials on how to change a foot controller on the internet. Good luck and let us know what you get. If your vintage foot controller "goes from zero to sixty" too quickly, your controller needs servicing. There are online tutorials and YouTube videos that will walk you through the steps. It's pretty easy. Yesterday I went to visit my mother-in-law and found this sitting in her garage. I had my husband load it in the back of his pick up and we brought it home. 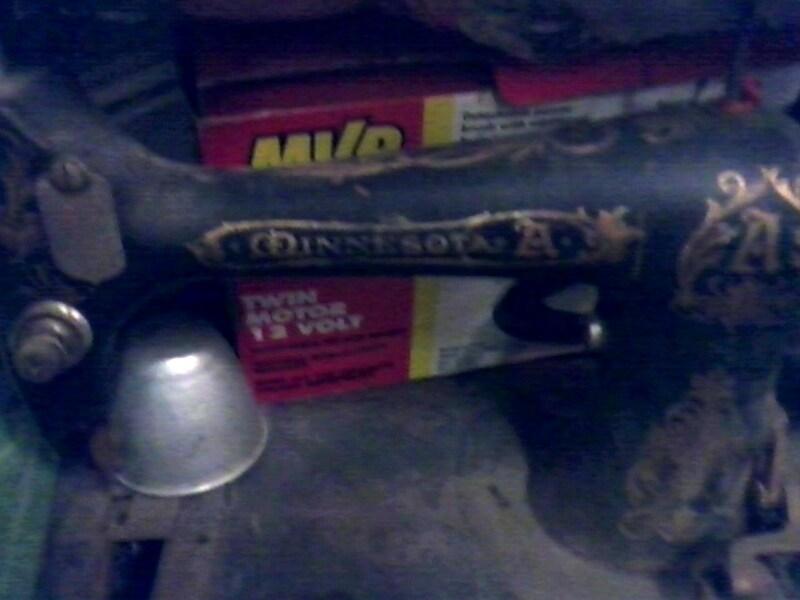 All I know is it's a Minnesota A, a treadle machine and it is very rusty and its missing a few parts. I'm not sure if it is worth trying to get it running or no. Sorry for the blurriness. There's not lighting in her garage. that MN A is most likely a Davis VS machine. Based on the tension type, this may be a later machine that takes "modern" size needles, but the shuttle and bobbins are only available vintage. Here are two of my Davis machines. I think they would both be older than yours. It also has a top clamp foot, so you can't get something like a hopping foot for FMQ, and the feed dogs don't drop so you need a cover plate for FMQ. 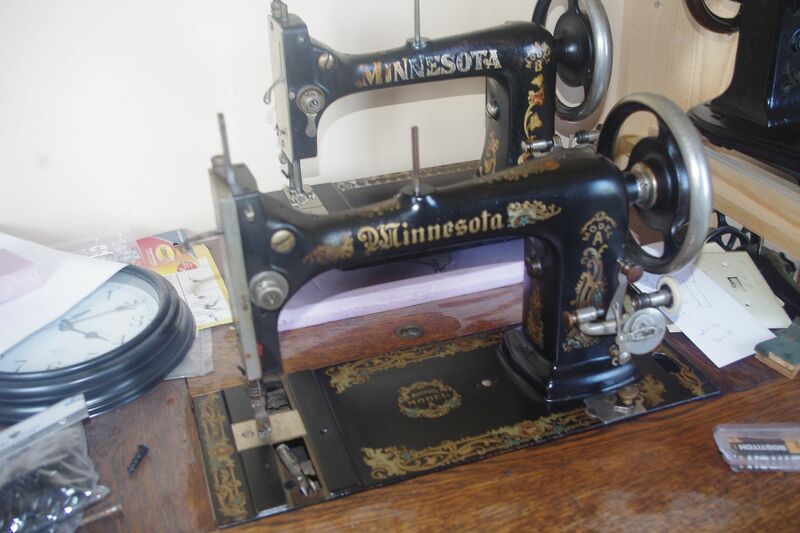 It's a nice machine, and should sew well as a treadle or hand crank - not sure if it's got a way to mount a motor to it like Singers have. However I don't think I'd recommend this type of machine for FMQ. Last edited by Macybaby; 02-07-2019 at 05:15 AM. Thanks Macybaby. I think I will try to get it fixed up and use it for piecing. That is if I can get it working. If you will do your search on Youtube for Singer 401 (or 401a) controller, you will find several very good tutorials. The controllers are the same on all the vintage Singers. The bobbins and shuttles in the left of this pic are similar to what you will want. Sears started in Minnesota so "borrowed : the name. Oil everything that should move. Don't get water near your decals. This is a Minnesota C with an odd controller. I do all my FMQ on a Singer 301. 7 1/2" throat and with the slant needle I have a good view of the working area. A king/queen is on the machine now. I did use a 1949 Necchi that looks similar to a Singer 15 for one quilt and it did a nice job. Actually, you will find the harp areas are larger on the vintage machines than the newer machines. When I first took my 301A to quilting, I almost felt like an outcast. Everyone else had newer machines with all the bells and whistles. I finally bought a new machine and I absolutely hated the thing. I practically gave it away just to get rid of it. I love the vintage machines, my favorite is my Viking 6440, then my two New Home L372's, and my three 301's (two long beds, one short bed). I can do all the maintenance on them myself. When I purchase each one I take it to my service guy (Wild Man) for a total checkup/cleanup. After that I can do most maintenance myself. My machines only go in for a check up occasionally. I'm now starting to work on it. I finally got the wheel to turn. It is still a little tough to turn but it is turning with no squeaks. Yeah!! I'm going to work on it some more. After I get it turning smoothly I will take it out of its cabinet and buy a base box to put it in. The stand it self I will replace the top and repaint the medal legs and use it a table for it to sit on in my sewing room. That is once I rearrange it. There is only so much you can do with a 10x10 room. Thank goodness for walk in closet (which houses my 9 ft christmas tree). I was searching online and ended up back on QB! Just a thought about a portable base for your sewing machine: the way the head sits now, in the table, you have a flat bed working space, and very likely close to an ergonomic position for your height. If you put the machine in a base, on top of a table, you will lose your flatbed working surface (more drag from the fabric ensues) and may feel as if your hands are "perched" uncomfortably at a weird height and angle. You may want to try it as is before making major changes. Thank you WIChix for the bit of info. 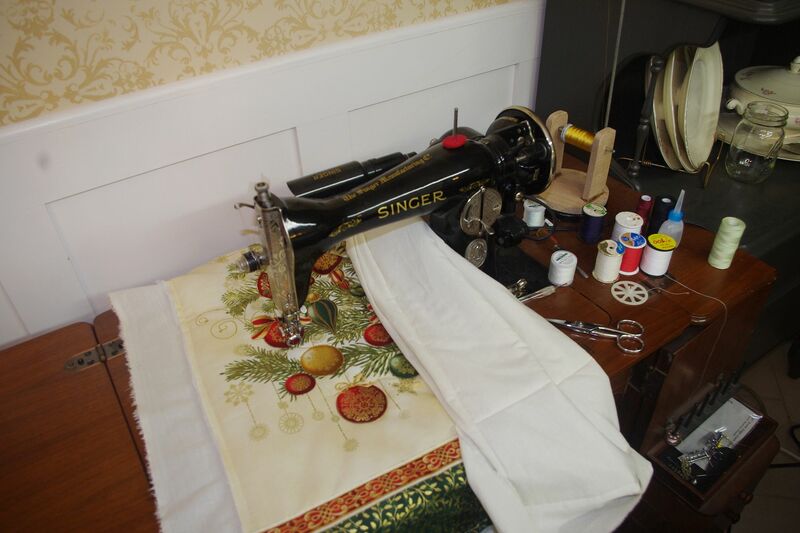 My newer sewing machine, singer model 5511, sits on my sewing desk right now. It puts more drag on my fabrics. I made my own extension table that's 24"x24" for it and that works well. I'm figuring of making my own base and I can get it as the same height as my singer so that I can use the same extension table.